Dear rising college freshmen: Your college days will–and yet, will not–make or break you. Many people hail college as a great transition time for emerging independent adults. Indeed it should be, if you’re going to do it. In fact, if you go to college for four years and come back without having learned anything beyond the academic realm, you’re doing it wrong. 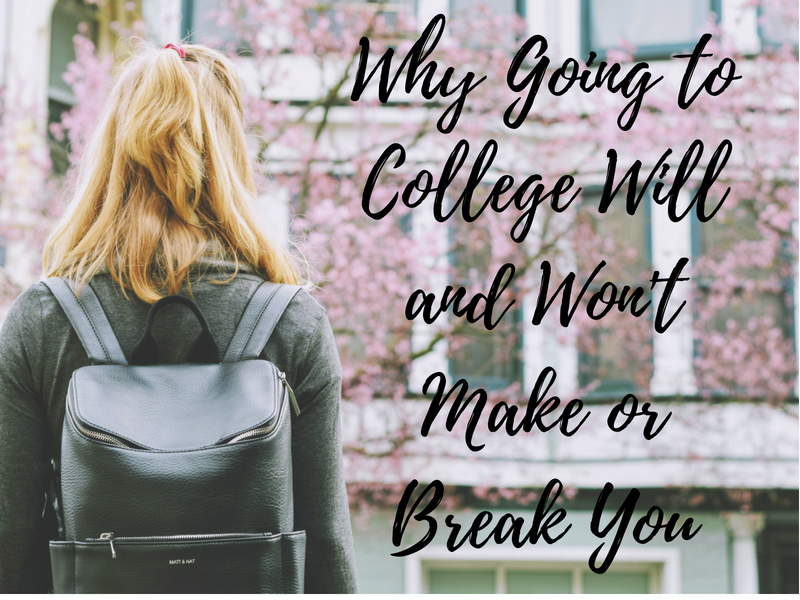 However, the college environment itself is not what will make or break you. In the Scriptures we see three others whom God will hold partially responsible for our lives: parents (Deuteronomy 6:4-7; Proverbs 22:6), spiritual teachers (James 3:1), and pastors (Hebrews 13:17). Colleges are not on that list, so they cannot be expected to shoulder the weight of your spiritual growth. Even secular colleges cannot bear the responsibility of producing “good citizens” and disciplined students, as the character traits and actions that make you an understanding, mature citizen of society and a motivated student start from the inside. In the end, you are responsible for yourself. It is you who will answer for your life before God (Romans 14:12; 2 Corinthians 5:10). Young adults, if you are hoping that going to college is going to suddenly make you a great student with self-discipline and a fantastic work ethic, I’m sorry to tell you this likely won’t be the case. Probably not too many of us actually think that’s going to happen, but we fail to take action now to prepare ourselves for what is to come. Benjamin Franklin is quoted as saying, “If you fail to plan, you plan to fail.” Are you putting in the work now to prepare yourself to manage your time well, eat healthily, and have integrity in sticky situations? Another area many Christian young people (and oftentimes their parents) have unrealistic expectations about is the outcome of attending a Christian college. We hear about the waves of young adults heading to college and leaving the church and we panic. We jump to conclusions that they are leaving the church because they went to a secular college and professors and classmates changed their minds about God. Of course we don’t want to become like them, so the natural solution is to go to a “safe” Christian school instead. Friends, this is putting a band-aid on a deep wound and hoping it will solve the problem. If going to Christian college is a reaction–a decision made out of fear–it is not going to produce the results we’re hoping for. I assumed that furthering my education at a Christian college was the only safe way to go and was the only way to guarantee I would continue to grow spiritually. The college environment can help or hinder spiritual or personal growth. But it does not guarantee it. The message is simple: Changing your location is not going to change your heart or the behaviors that come from it. We’ve all heard the stories or we know the people. Friends, family members, and strangers who have gone off to college and come back changed…and not in a good way. We’ve heard of the rotten influences of peers, and the immense pressure from faculty (God’s Not Dead, anyone?). We’ve heard of the political correctness and the “tolerance” mantra. We’ve seen how the social life is often nothing more than an excuse to drink illegally, or worse. Even in Christian schools, there are those who fly under the radar committing crimes or academic dishonesty, those who backbite and tear people down, and those who form exclusive cliques. But beyond the social environment, going to college may break you for a number of other reasons. Depending on your major and course load, you may face an overwhelming mountain of school work. As the semester marches on, your hours of sleep decline weekly, forming an example of negative slope that would make your algebra professor proud. If you’re working in addition to school, your calendar likely overflows with commitments and you feel like you’re permanently running behind. College is hard. But despite all the factors that can wear you down, there’s still hope. 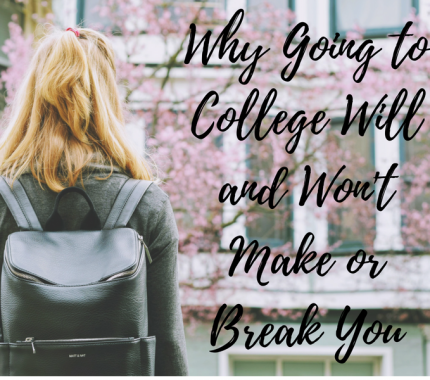 Here’s the good news: if college breaks you, you have a wonderful opportunity to make yourself again. You can rebuild, stronger in the places you discovered were weak. You know what you need to fight, now, and you have the chance to work on it. I’m about to start my second year at a public state university. The first year was challenging–stretching is the “nice” word we would use for it. I had to learn how to commute, how to balance school and work, and how to handle the expectations of five professors at once (new to this homeschool grad). I learned how to reach out to classmates and professors alike–how to interact with people who lived very different lives than me and had totally different worldviews. I fought my way through two science classes as a committed truth seeker. I learned that community doesn’t happen automatically, that I need to build it by investing in others and allowing them to be part of my life as well. Dear future college student, the challenges college will bring can help you grow, if you let them. The college itself isn’t going to make or break you, but you can take whatever environment you’re given and use it to grow. I’ve grown in so many incredible ways that are a direct result of the secular environment I’m in. My faith has been strengthened because of the trials I’ve faced. The opportunities to minister to others are ones I would not have received had I gone to a Christian college. Grow or die–that’s the challenge. Please, choose now to fight for growth. Don’t forget you’re not alone, even if you’re far away from those you know and love. There are people who care about you and are praying for you, and would be thrilled to help walk you through the struggles you encounter. I’ve been overwhelmed by the love and support I’ve received! Feel free to contact me if you need to talk through any of this, or would like me to pray for you. If people are walking away from the faith in college, it’s time to trace the problem back further. Where were these students before college? Who invested in their lives as high schoolers? Who and what influenced them as teenagers? Whose examples did they follow? Were they trained to encounter and overcome challenges from a young age? Did parents teach them to make being part of (including serving in) church a priority? Did parents, relatives, church members, and/or teachers train them to feed themselves from God’s word? These are some of the questions we should be asking rather than assuming it’s colleges themselves that are causing young adults to leave the church and the faith. As for those headed to college or in college today: Instead of viewing college as the experience that will either fix everything or ruin everything, see it as a wealth of opportunities to learn and grow. Every college situation has its upsides and downsides. If you take responsibility for yourself and your decisions, your expectations will be more realistic and your time spent more beneficial. You can graduate with a stronger, more personal faith and a deeper relationship with God. Stay faithful to gathering with believers and encouraging one another (Hebrews 10:25). Read your Bible and pray regularly. Seek hard after answers to the questions that will assuredly come your way. And remember, God is with you always. This is really good–and very timely for me! Thank you for sharing it! I’m glad it was helpful, Katherine! Praying for you!